The Galaxy S series now has a multimedia player under it’s belt, the Samsung Galaxy Player. Samsung promises that the Galaxy Player does everything that it’s current flagship, the Galaxy S does except make calls. 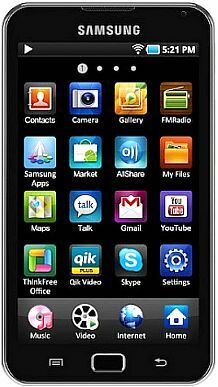 The Samsung Galaxy Player is equipped with A 1GHz Cortex A8 processor, dual cameras, a 3.2 megapixels back-facing camera and front-facing VGA webcam, VoIP support and video calls via Wi-Fi 802.11b/g/n. The Galaxy Player supports as DivX, Xvid, WMV, MPEG4, and H.264, while audio format include MP3, WMA, AAC, Ogg, and FLAC. No AMOLED but Samsung has equipped the Galaxy Player SuperClear LCD and will be available in 4″ and 5″ variants. Samsung Galaxy Player will be available in 4″ and 5″ variants as well as 8GB and 16GB versions (for each screen-size variant). No clear price or launch date is available.